Price Range: US$ 175-275 (March 2018). Large price differences. Be careful! Buying Advice:😕 Should we really pay around US$ 200 for such a young Malt? 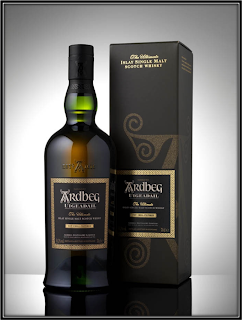 Sweet, Young, Medium-Dry and a little Dusty with deep characteristic First Fill Sherry cask Aromas and a touch of Islay. The Alcohol is not fully integrated. Lots of Dried Fruit like Raisins, Sultanas, Plums, ripe Figs, Berries and Currants. I also find Brown Sugar, Treacle, Orange Peel, Salted Caramel, Dark Chocolate, Toasted Barley, Fresh Wood, Rum soaked X-mas Cake, Tobacco and Nuts. Slightly Burnt Toast, Cognac, Dusty Shelves, Floral Perfume, Tar, Ashes, Iodine, Burnt Grass, light Smoke, Meat and Bacon on the BBQ, Old Leather, Pepper, Ginger and Menthol. Strong delivery with noticeable Alcohol. Bitter-Sweet and relatively Young. I would guess the Spirit matured for around 8 Years. There's a rough feeling to it. Salted Caramel, Treacle, Dark Red Fruit, Chocolate, Orange Peel, Walnuts, Fresh Oak, Cherry-Flavoured Cough Syrup, Pepper, Ginger, Dried Herbs and Licorice. Smoke, Dirty Earth, Toasted Barley, Vanilla, Cloves, Nutmeg, Cardamom, Strong Espresso and Leather. Middle-Long, Bitter-Sweet and quite Dry. The Alcohol is still strong. I find Dark Red Fruit, Cherry-Flavoured Cough Syrup, Malted Barley, Dark Chocolate, Salted Caramel, Dried Herbs, Nuts, Tar, Old Leather, Tobacco, Strong Espresso, Orange Peel, Earthy Peat, Smoke, Fresh Oak, Varnish, Walnuts, Licorice, Pepper, Ginger, Cloves and Cardamom. I added a few drops of Water and on the Nose the strong Alcohol disappears. More Red Fruit appears like Strawberries, Raspberries and Blackcurrants. A bit of Honey perhaps. The Finish becomes rather Short and Leathery but the Palate becomes more balanced. My advice would be to add a few drops of Water to this Bowmore. Certainly interesting but too Young for my taste. There's not enough balance between Fresh Wood, Wood Spices, Sherry and Spirit. But then again, you can't expect the Devil to be smooth and elegant! This Bowmore is the 3rd and final Limited Edition of the Devil's Cask Series. 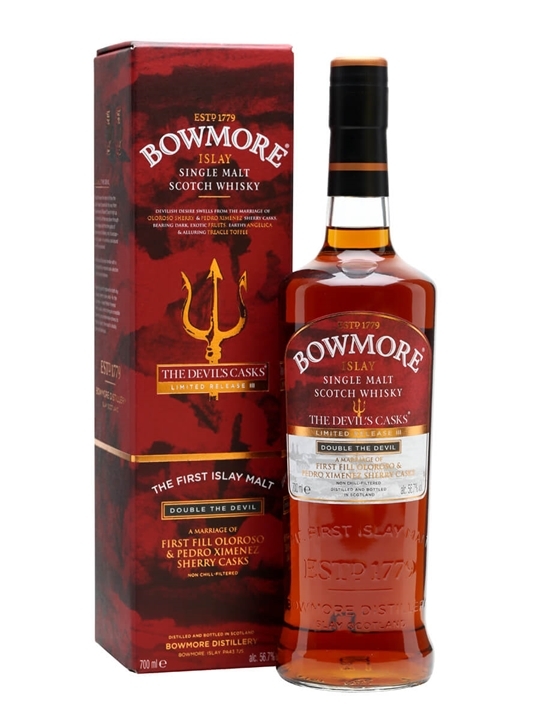 The first Edition was released in 2013, a 10 Year Old Bowmore that matured in First Fill Oloroso Sherry casks. The second edition followed a year later and was also a 10 Year old but this time the Spirit matured in First Fill Pedro Ximenez casks. The third NAS edition was released in 2015 and matured in a mix of First Fill Pedro Ximenez and Oloroso casks. It's the latter one that I'm reviewing today. 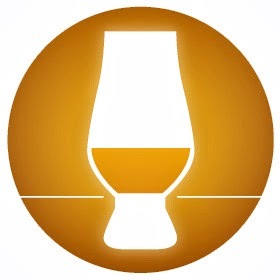 The story behind the Devil's Casks series is the following. One day, the devil tried to hide in the round Bowmore church. 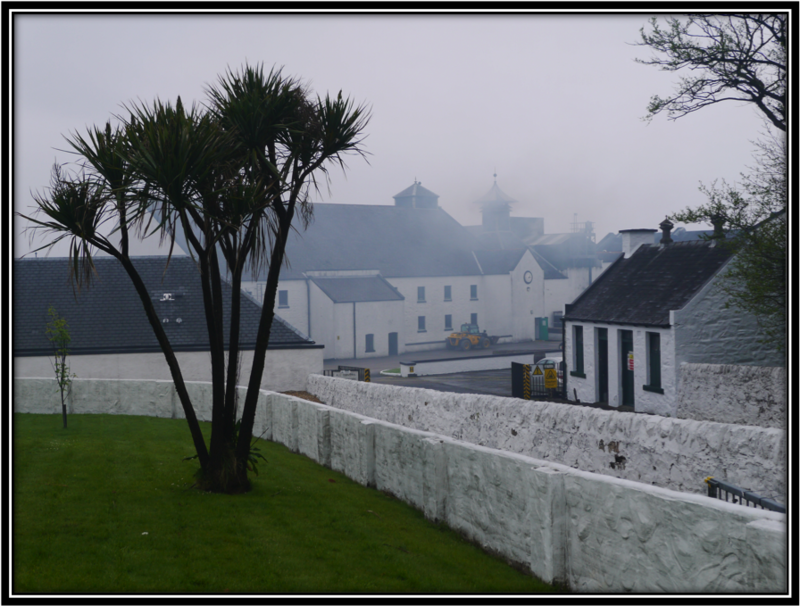 The people of Bowmore chased him out of the church but the devil escaped through the distillery. It was assumed that he made his escape in a Whisky cask heading for the mainland on a boat called The Maid of Islay. Nice story! 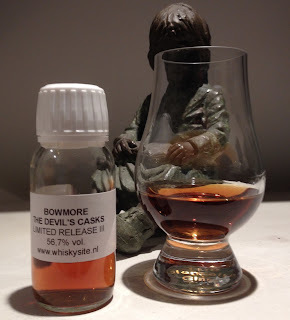 The Bowmore The Devil's Cask Limited Release III is not a bad Single Malt and the Tasting Experience is quite interesting. This is not at all a mainstream boring Malt. You must love Sherry and/or Red Wine Finishing though to be able to fully enjoy this Single Malt. The Islay characteristics are there but the Sherry is quite overwhelming. My main issue with this Bowmore is its apparent youth. As a result, there's not enough balance between the various Aromas and Flavours. It all smells and tastes a bit unfinished. I'm glad I had the opportunity to taste a sample of this Single Malt but I wouldn't pay the odd US$ 200,-- for a bottle of this Bowmore. It's simply too young for that kind of money!